Another love gift from the Milky Way recorded on digital audio. 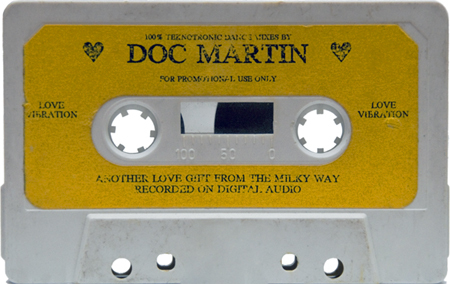 Calling all ravers…calling all ravers… This is part of the intro to this oh so elusive Milky Way tape, of straight up techno tracks, mixed by Doc Martin in 1991. Big thanks to Tom Schultz for contributing this! I’d love to get the rest of the Milky Way series up here. If anyone else has any of these tapes they would be willing to contribute, please get in touch. Great mix..Is it me, or did Doc’s mixing sound really lame in comparison to this in the latter part of the 90s? Thanks for posting this tape up. Brings back tons of memories! I just wanted to point out how IMPORTANT it is to find and perserve the MILKY WAY TAPES. These “MilkyWay Rave Tapes” were basically Live Recordings made by the MilkyWay guys, of the original DJ’s mixing at the early RAVE parties. These tapes were the only way back then for “ravers” to listen to TECHNO and their favorite songs(over and over and over). There were soo many good songs before the age of the MIX TAPE in 1992,’Hot Lemonade’ is a very early example. I’ve been all over the internet searching for hours and countless hours,but to ooooono avail.I may have found a copy of a copy of Steve Loria Live at Ahknahten. I will send it as soon as i have it,Yea. The first tapes I was able to take home with me were given to me by Mr Buzz of Acid Hits Mix Tapes in early 91′ I have not seen his mixes on ANY oldschool L.A. site…and thats a damn shame. They are FANTASTIC.Ron D Cores “Hot Lemonade” tapes came home next. And then this “Milky Way” tape right here. The whole Milky Way series is outstanding. I have a Steve Leclair Milky tape as well as a Moon Pup that arent posted. Historically this is a fantastic tape. Doc playing all the techno classics….when’s the last time you heard him do that? Some of the mixes are offbeat but the vibe that it sends out is sick. Definitely L.A. ’91. In response to Josh’s comment. I spent two years in SF from 1989-1991. I was at the first two full moon raves under the Golden Gate bridge with the Wicked Sound System. I had tapes from Marky, Jeno & Doc. When I moved back to NYC in 1991 I met Joeski & gave him all the tapes that I had in my collection. I gave them to Joeski because I thought he’d really dig them. 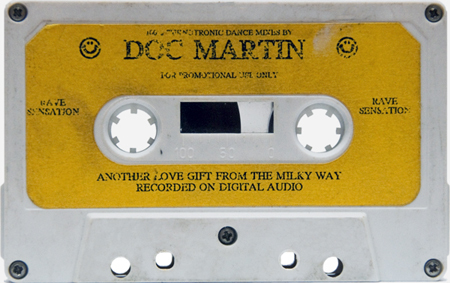 In fact, when I moved to SF in 1989 & met Doc Martin, I had just passed through about 6 or 7 years at the Paradise Garage & had a ton of Larry Levan mixtapes & some really great WBLS-FM by Bobby Konders. I gave all of my tapes to Doc & Marky. Gee, when I met Doc he wasn’t even spinning house. He was spinning Janet Jackson & Digital Underground. I guess he got schooled real quick. God bless Doc Martin. He’s an important bridge between the classic Garage sound & the next wave of West Coast Rave. I would like to offer an insight after hearing Larry Levan spin for a number of years. Larry Levan WAS the history of Dance Music every Saturday night. He would play classic Soul & Funk from the early 70’s, then move on to the classic Disco era sound & then on to the House era mixed with New Wave & Rap. My point here is to demystify dance music a little. There would be no House music if there wasn’t first a James Brown or an Aretha Franklin. Larry would spin “Green Onions” or “Rock Steady” or “Love Is The Message” every week. Why? Respect for the track. Just a friendly reminder to respect the roots of the culture too. A lot of DJ’s are far removed from the original spirit of the early days of the DJ movement. Wooooo 6 or 7 years at the Paradise Garage! Respect bro! Why you give away all your tapes!? And those first Wicked parties musta been out of this world. Yes Mr Levan had a HUGE part in the beginnings of dance music (and LUCKY you to be a part of that)! Also dont forget about Ron Hardy at the Music Box in Chicago. Even though I never got to see him live I have heard live recordings and he inspires to this day. Much respect Justin…take care dude! Hey Josh. Why did I give away my tapes? I gave them to Doc Martin. He knew what to make of the tapes that I gave him! I would say that I did the world a favor giving my Garage mixtapes to Doc. So what your saying is that the Larry Levan mixtapes you gave Doc inspired him in those early years to become the DJ he is today? Did you make copies of the tapes? I still dont understand why you gave the tapes away…..lol. Obviously you love the music…why would you give it away? You don’t see anyone but me saying that I gave my Garage Mixtapes to Doc. You could say that I was an influence on Doc about the subject of House Music. I don’t think there was anyone at that moment who had more information in their hands then I did circa 1989. In fact, Doc handed me a mixtape that he had done & asked me for my opinion. His mix had so many train-crashes on it that I could only offer a Larry Levan mix to show him what a good mixer sounded like. Does that make sense? Still looking for the Hot Lemonade tape that starts out with T99 Anastasia with Eon’s Light Color Sound intro sampled over it. Would loooove to hear that again. Someone is sending in a Hot Lemonade tape. If it’s that one, I’ll post it up straight away. I just uncovered 3 Hot Lemonade original tapes in storage Zack…I think there was a total of 4 if I remember right. I’ll see if I have the one your looking for. Justin…I wonder if Doc still has those Larry tapes? I would love to hear them! @Jason – Someone sent me an mp3 rip, I can send it over and see if you can clean it up any and use it! I’ll do so in just a moment. @Josh/Jason – Can’t wait, that’s the one tape I’ve been after forever.. Wore mine out years ago and never heard again. I created, recorded, edited, mastered & distributed each and every one of “The Milky Way Rave Recordings” I recorded 30 different sessions, reflection the very best in early LA Acid House. I am so… glad that so many of you still enjoy what we created back in the old skool days. At Milky Way Recordings I always tried to capture the excitement of the best of the best in DJ live sets. Mike Paris! What’s up man? People are doing serious hunting for those Milky Ways dude… Nice to see you man, it’s been ages. Ring any bells? Sorry no Anastasia These tapes are originals but most likely dubbed pretty far down the line as the sound quality is very poor. If you need me to I can fast forward to side 2 and see what those sides start with. I’m almost positive that there were 4 different tapes…I believe they were given out as a promotion for a party on July 12th 1991. I just came upon a small utility box that I’ve had in storage since ’96 containing about a hundred mixtapes that I had collected from ’91 to ’96. The 3 Hot Lemonades were part of this collection. As for the 4th tape….maybe somebody else could help out. I’m planning on sending these and a few others in to Simphonik to make them available for your listening pleasure. I think the other side of the one I had started with Ron’s infamous ‘the average length…’ sample then Technarchy, so that’s probably the one! I’ve got one of these MilkyWay series tape with DJ Phil Smart from Australia and will try to send it in. Some of the best vocal acid house of the very early 90’s was on tape. Pingback: Must have DJ sets/mixes downloads. - Page 2 - Plurlife - Electronic Music, DJs, Clubs, and Parties! I just discovered a track that is off this tape…A.E.K. – Sudden Death. (Right after Quadraphenia). I saw there wasn’t a tracklist so here ya go….couple missing. The old school techno genius Frank Ramirez Id’d that last missing jam on this mix! Cheers bud!! It is Axe Corner – Tortuga (Out SLD mix) Tracklist is now complete! !